Text-to-911 provides the ability to send a text message to 9-1-1 from a handheld device in emergency situations when a person is unsafe or unable to place a voice call. One of the government’s most important duties is to provide for the safety of residents, and this new system increases access to emergency responders to help protect everyone, especially victims of domestic violence and those who are deaf or hard of hearing. In announcing the new technology, the governor cautioned residents that voice calls to 9-1-1 remain the best and fastest way to contact emergency services whenever it is feasible to do so. Text-to-911 is only intended to be used when absolutely necessary or needed, which is why the new system’s theme is: Call if you can, text if you can’t. Text-to-911 is specifically intended for individuals who are deaf, hard of hearing, or have a speech disability. It is also intended to be used when people are in certain situations that would be unsafe or impractical to place an audible voice call, such as during a home invasion, an act of domestic violence, or active mass shooting, and also during medical emergencies that render a person incapable of speech. 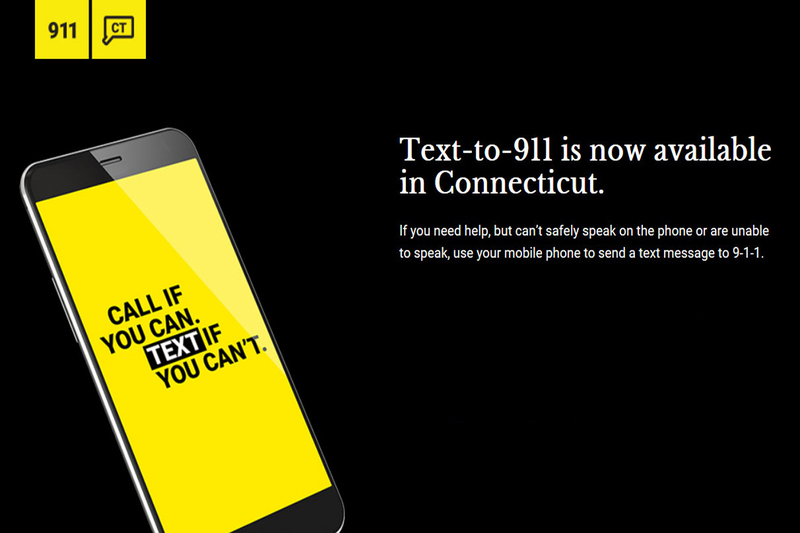 For more information on the Text-to-911 system and to see a demonstration of the capability, visit www.Text911CT.org.